Need to number line items from a flat file of orders during the import. Orders with more than one line item are numbered 1, 2, 3, etc… I have researched this and tried several things but cannot get the desired results. Using the GroupBy function on the order number and the AutoID function (GroupBy) it comes close. It starts with 1 on the first record then 2 with the second even if it’s another order. However, multi line orders it numbers in sequence but starts with 2 as does every record but the first. 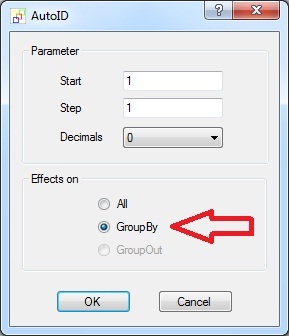 i guess you have just forgotten to switch on the autoid "groupby effect on" option? i've made a little example to demonstrate how it’s works. please have a look to the attachment. note: the groupby heater only works proper with sorted records ! This you can do with the help of the .NET Script Heater and the following little script. Robert I cannot thank you enough…that’s exactly what I’ve been trying to do. I’ve been programming with access for over 10 years. Flowheater has made importing and exporting data so much easier. And now it looks like I’m going to need to learn a little more about the .NET script.